Intense amounts of practice go into being a college athlete. Add the pressure of competition to long hours of practice, and you have a recipe for extreme stress. Thus, many athletes of all different sports have developed certain routines and rituals that help them focus, destress and prepare for competition. The track and field teams contain several student-athletes with routines of their own who were happy to share with The Funion. Upon making this remark, Taylor took out a large bottle and began shaking the pasty substance inside. Though it looked like protein powder, she was quick to tell The Funion that it was drywall dust. Taylor continued, saying that she breaks up the drywall in advance so she can go straight to refueling with her mixture after a hard workout. 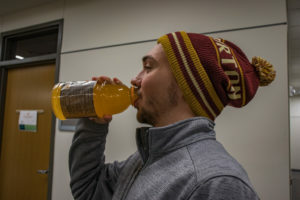 Hurdler Garett Naibe said that race day hydration was the most important part of his pre-race routine, and spoke of a drink he simply called “fast juice.” When asked to expand on this curious idea, Naibe produced a bottle of Gatorade from his backpack. In addition to drinking this strange yet appealing potion, Naibe told The Funion that music helps him get pumped for races. “I listen to the Friends theme song on repeat and force myself not to clap. It really gets me in the zone,” Naibe said. Distance runner Russell Andrews shared what he calls a long-term solution. He commented that endurance is critical, especially on long runs. On hot days, Andrews said that he keeps a little extra nutrition with him. He offered to demonstrate, and took what appeared to be a wad of cotton candy from his pocket. Andrews then began to tear it into smaller strands, revealing it to be not cotton candy, but insulation. He then began to pack it inside his bottom lip as one would pack chewing tobacco. Marvin Goldstein, who throws shot put and discus, has a much simpler routine which he shares with the other throwers. Preparation for racing is important, but keeping a level head during a race is just as valuable. Perhaps the only thing stranger than the pre-race routines of the track athletes is what goes through their heads during races. Taylor imagines all her competitors as giant centipedes, and Naibe said he thinks of his opponents as angry geese, but other runners have more intricate mental images that keep them moving. Distance runner Erin Focks said she pictures the finish line as a bag of Doritos. While Focks said this usually works for her, there is one person in particular that there is no excuse not to beat. She declared that one girl that runs for Ohio Northern University reminds her of an elementary teacher whom she despised. Whether it be preparation for meet day or mentality during the race, the track and field teams are certainly prepared for competition. Let’s hope their hard work pays off this season.